In an interview on ‘‘Fox News Sunday,’’ President-elect Donald Trump said he’s ‘‘very open-minded’’ on whether climate change is underway. WASHINGTON — President-elect Donald Trump said Sunday that ‘‘nobody really knows’’ whether climate change is real and that he is studying whether the United States should withdraw from the global warming agreement struck in Paris a year ago. In an interview on ‘‘Fox News Sunday,’’ Trump said he’s ‘‘very open-minded’’ on whether climate change is underway but has serious concerns about how President Obama’s efforts to cut carbon emissions have undercut America’s global competitiveness. There is a broad scientific consensus that human activity — including the burning of fossil fuels for transportation, heating, and industrial manufacturing — is driving recent climate change. In its most recent report, the Intergovernmental Panel on Climate Change concluded that it is ‘‘extremely likely’’ that, since the 1950s, humans and their greenhouse gas emissions have been the ‘‘dominant cause’’ of the planet’s warming trend. The top 10 hottest years on record have all been since 1998, and 2016 is expected to be the hottest year since formal record-keeping began in 1880. Trump made the comments as reports emerged that he has narrowed his search for energy secretary to four people. Bloomberg News, citing people close to the selection process, said former Texas Governor Rick Perry is the leading candidate for the energy post. It said two Democratic senators from energy-producing states — Heidi Heitkamp of North Dakota and Joe Manchin of West Virginia — are also in the mix, along with Ray Washburne, a Dallas investor and former chairman of the Republican National Committee. If Trump picks any of the four, he will be breaking with recent tradition of putting scientists at the top of the environmentally sensitive Energy Department. Among other things, the agency is responsible for policies on the safe handling of nuclear material and on emerging energy technologies. The current secretary, Ernest Moniz, is a nuclear physicist who headed an energy initiative at the Massachusetts Institute of Technology. In a 2011 Republican primary debate, Perry famously forgot that the Energy Department was one of the three federal government agencies he wanted to eliminate. The other two were the commerce and education departments. 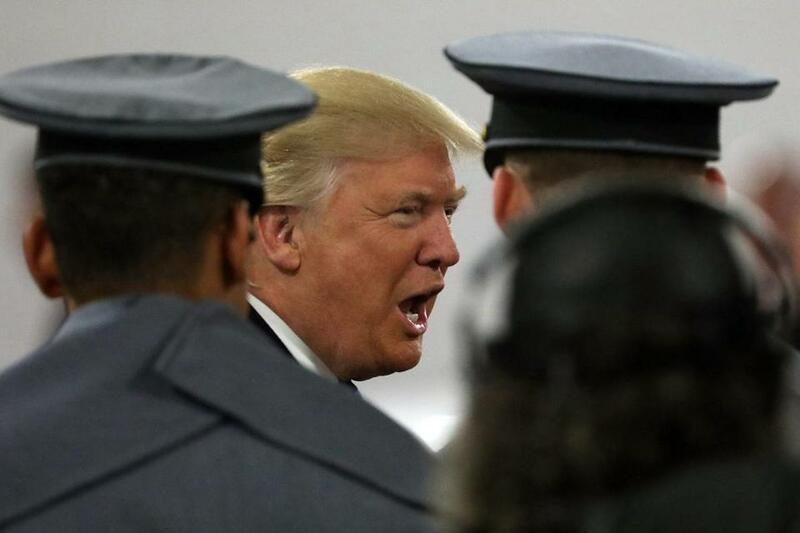 Trump met with Perry and Washburne while attending the Army-Navy football game in Baltimore on Saturday. It was at least the second time he had spoken to the men about roles in the new administration. Trump interviewed Heitkamp in New York on Dec. 2, and is scheduled to meet with Manchin on Monday. Trump’s climate change remarks Sunday were not the first time he has discounted the established scientific view. During the presidential campaign, Trump referred to climate change as a ‘‘hoax’’ perpetrated by the Chinese, a comment he later described as a joke. But during a town hall in New Hampshire, he also mocked the idea of global warming. After getting a show of hands, Trump concluded that ‘‘nobody’’ believed climate change was underway except for Andrade. During Sunday’s Fox News interview, Trump said he needed to balance any environmental regulation against the fact that manufacturers and other businesses in China and elsewhere are able to operate without the kind of restrictions faced by their US competitors. “We can’t let all of these permits that take forever to get stop our jobs,’’ he said. The New York businessman made the same critique of the Environmental Protection Agency, to which he has nominated Oklahoma Attorney General Scott Pruitt — a climate change skeptic — as the head. Although he has given mixed signals on whether he would back out of the United States’ voluntary commitments under the Paris climate agreement, it would take several years for the next administration to withdraw now that the agreement has entered into force. Last week, Trump’s transition team for the Energy Department asked officials there to identify which employees have participated in international climate negotiations or worked on domestic efforts to cut greenhouse gases, such as calculating the social cost of carbon. Several scientists, federal union officials, and public watchdog groups have expressed concern that these individuals could be targeted for retaliation. It is unclear which permit application Trump was referring to, but he has repeatedly criticized EPA rules.